Comments: Anne Shirley Bruce Dorrier was born in Scottsville on November 6, 1920 and was the daughter of Thomas Ellison and Mary Estes (Browne) Bruce. She graduated from Scottsville High School and Randolph-Macon Women's College, marrying her childhood sweetheart Lindsay Gordon Dorrier, in 1941. Together Anne Shirley and her husband raised their four children (Lindsay, Claire, Bruce, and Richard) on their farm (Enfield) near Scottsville. Anne Shirley also earned a Master's Degree from the University of Virginia and taught fifth grade at Belfield School for over 20 years. She then retired to the farm and with her husband began to raise chardonnay grapes. Anne Shirley and Lindsay developed a small vineyard which they tended for nearly fifteen years, and they supported the efforts of other local vintners in developing the wine industry in Virginia. Anne Shirley served in the Scottsville Museum for years as a Museum trustee, volunteer, and docent for many years.. She was passionate about our town's history and generously shared her wonderful collection of William E. Burgess photos with the Museum, which depicted local citizens, businesses, and events of the 1900-1930 time period. Listening to her talk about Saturdays in Scottsville was simply electrifying as she depicted streets teeming with area citizens, who had come to town to shop and visit with friends. Anne Shirley spoke most charmingly of the long walks she took her young children on each summer afternoon up the tree-lined road to the Uniroyal Tire Plant and back downtown to Bruce's drugstore for ice cream. She also spoke fondly of her joyful opportunities to fish, canoe, and swim in the James River from her childhood through adulthood. As she described the James in her oral history, "The James River was a huge part of our summertime in Scottsville!" 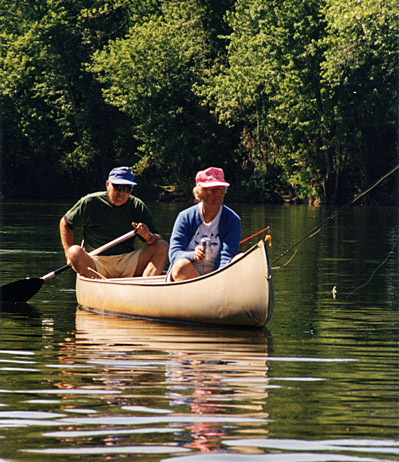 Shown below is a 1995 photo of Anne Shirley canoeing and fishing on the James with her husband, Gordon. Anne Shirley's husband passed away in 1996, and she continued living on her farm and participating in many Scottsville activities as a volunteer and an active contributor to the town and to Albemarle County. Anne Shirley loved her Scottsville life and made us all smile as we listened to her sun-filled, happy stories of her local life. On Saturday, October 11, 2014, Anne Shirley Bruce Dorrier passed away peacefully at her farm near Scottsville. She is buried at Christ Church, Glendower, near Scottsville, Virginia. We Museum volunteers will always remember Anne Shirley fondly, and because of her efforts before us, we want to continue preserving our town's history as she did for so many years as a faithful Museum volunteer. Thank you, Anne Shirley, for your inspiration and support to Scottsville history preservation. 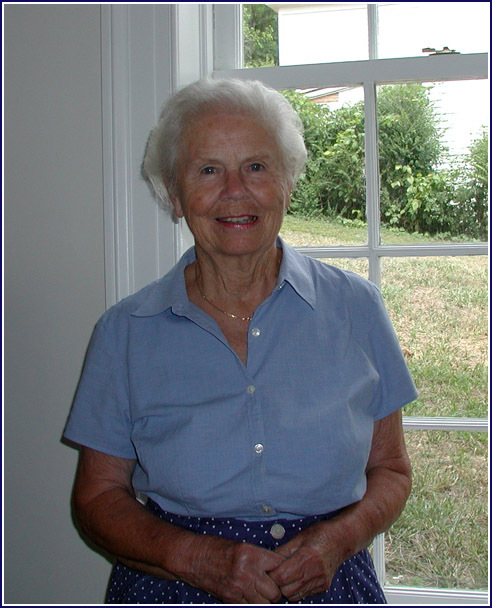 Anne Shirley Bruce Dorrier, 93, died on Saturday, October 11, 2014, at her farm near Scottsville, Virginia. Anne Shirley was born in Scottsville on November 6, 1920, and lived there for all of her life. She graduated from Scottsville High School and Randolph-Macon Woman's College, marrying her childhood sweetheart, Lindsay Gordon Dorrier, in 1941. Together they raised four children on the farm near Scottsville, where she continued to live after his death in 1996. Anne Shirley is survived by her children, Lindsay, Claire, Bruce, and Richard and their spouses; and numerous grandchildren and great grandchildren. Anne Shirley earned a Master's degree from the University of Virginia and then taught fifth grade at Belfield School for over twenty years. She then retired to the farm and with her husband began to raise chardonnay grapes. They developed a small vineyard which they tended for nearly fifteen years, and they supported the efforts of other local vintners in developing the wine industry in Virginia. Anne Shirley was devoted to Scottsville and to Albemarle County. She worked in the Scottsville Museum for years and was a member of the Southside Alliance, an interracial group founded during the 1960's whose mission was to promote diversity and friendship. She also was one of the early members of the Tri-County Riding Club and encouraged the riding and social activities of the club as the club grew and developed. She worked as a volunteer for many years for the James Madison Library both in Scottsville and in Charlottesville, serving on the Board of the Library. Anne Shirley was also a member of the Virginia Creepers, the Contemporary Club of Albemarle, and the Albemarle Pippins. She was a dedicated fisherman, an avid tennis player, a devoted gardener, an enthusiastic ocean swimmer, a passionate music lover, and an excellent cook. A memorial service for Anne Shirley was held at Christ Church, Glendower, near Scottsville, Virginia, on Saturday, October 25, 2014, at 11 a.m., followed by a reception at "Endfield", the family's home at 8045 Scottsville Road.